The Halsey Bops were a white gang that had a small, 5-block turf in Bushwick, Brooklyn. Putnam Avenue to Halsey Street and Knickerbocker Avenue to Wilson Avenue was their turf lines and they also liked to hang out in Putnam and Halsey Parks. 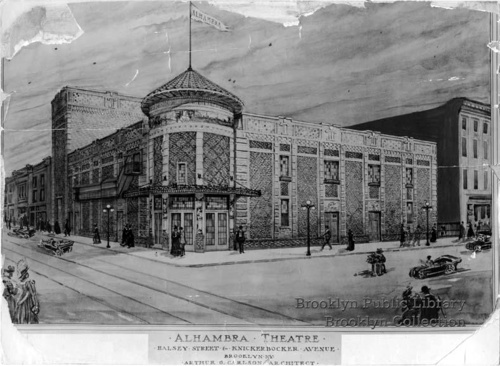 Not too far from Halsey Park was the Elhambra Theatre. Closed in 1951, the building was unused, but the Halsey Bops would climb the fire escape and hang out inside the spooky building. Split into two groups ranging from 12-19 years of age, there were the Halsey Bops who were the older guys, 16 years of age and up and then the Halsey Tots who were members 12-15. Although the groups were of different ages, it was still one gang with a total between the Bops and Tots of about 40 members. The Halsey Bops were mostly Italian and Irish with a few Spanish guys, and despite the small size of their gang they made their presence felt from fights and rumbles to their graffiti that could be found on the cements supports of the Cypress Avenue LIRR and connecting line trestle. The Halsey Bops had a President (Tommy), Vice President (Ray) and War Counselor (Frankie) and fought mostly the Saints who were from nearby Queens. The Bops didn’t use knives much, but did like their guns, and would make home made zip guns for their rumbles. They sometimes fought the Ellery Bops, a nearby White gang that hung out on Grove Street, a few streets from their turf and not to be confused with the Puerto Rican Ellery Bops from Williamsburg area. 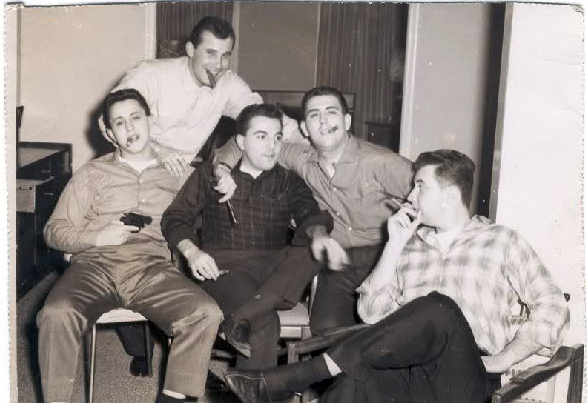 Below is a picture of some Halsey Bops mugging for the camera, one of them with a pistol in his hand, and stogie clenched in his mouth, circa 1959. Perhaps it was some of these Bops who were the ones that shot at the plate glass window at 776 Jefferson Avenue. For a fascinating look at a letter written by Ellery and Halsey Bops in the spring of 1958, click on this link. It was written to the Daily News during the height of the trial against the killers of Michael Farmer.